DON’T WASTE ANY TIME…GET COOKING! My go-to nutritious soup when I feel like an easy night of cooking has to be this Chinese inspired last-minute chicken corn soup packed full of flavour. Chicken corn soup is traditional specifically in southwest China, India and other countries where corn is a staple in many diets. Corn is also fairly inexpensive to buy and for this recipe I use one can of creamed corn. If you don’t have or can’t buy creamed corn you can simply whiz up a can of peaches and cream corn with a splash of cream and a touch of sugar. For the adventurous cook you can make your own creamed corn. I’ve made many chicken noodle soup recipes over the years but as a busy mother and wife sometimes it’s nice to have a short-cut chicken noodle soup especially on a cold winter day. If you’re looking for a healthy chicken noodle soup that is packed full of flavour and loaded with sweet corn that can be made in a jiffy, this is a recipe you’ll want to tuck away. If eating out is out of the question because you’re trying to stick to a budget you can’t go wrong making a huge pot of chicken corn soup. You can freeze the chicken corn soup in individual containers which you can defrost and enjoy for lunch or dinner when time is pressed. My chicken corn soup recipe eliminates the need to slave over the stove for hours boiling a chicken carcass to make chicken broth. For this recipe I chose to use chicken stock cubes which really accelerates the cooking process. Even when I do cook down a chicken I may add a chicken stock cube or two to bring out the flavours if needed. What I enjoy about my chicken corn soup is the calming effect it has for someone who is feeling under the weather. At least that’s how I feel about it. It really does hit the spot as that’s what any chicken noodle soup should do. Add a splash of sesame oil to add the Chinese inspired flavour and top with finely chopped spring onion. If it’s Indian flavours you’re after add a 1/4 teaspoon of cumin, turmeric, garlic and chili flakes. I like to serve chicken corn soup along a tomato and cheese toasted sandwich with mayo or grilled cheese and bacon sandwich. 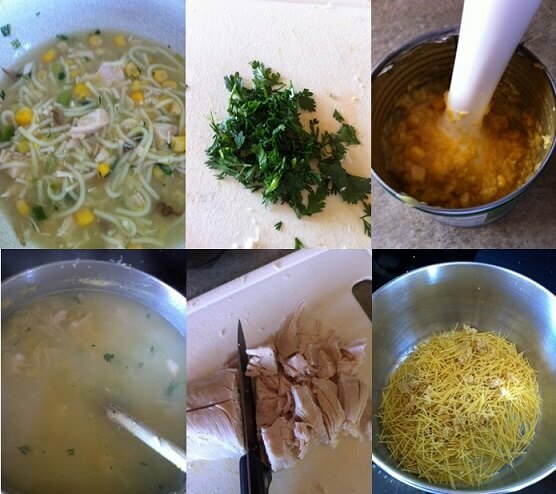 Really, you can pair any sandwich with this chicken corn soup and it would be perfect. Soup and sandwiches are practically married! If it’s a lighter lunch or dinner you are after pair this soup with a slice of fresh bread, homemade bap bun or cheddar chive biscuits. Making a quick pot of chicken corn soup doesn't get any easier than this for lunch or dinner any day of the week. Crush chicken stock cubes and place broken spaghetti into a stock pot and pour approx 10 cups boiling water over or your heated chicken stock. Add your freshly chopped herbs and taste before adding salt and pepper as desired. Add the creamed corn and wait until the spaghetti is cooked about 3-5 minutes. 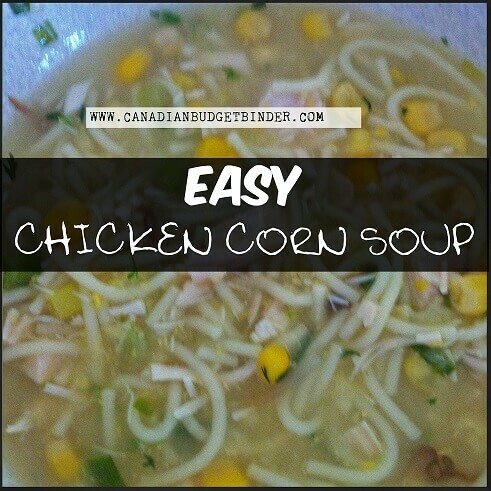 And there you have it a quick, easy and frugal chicken corn soup to enjoy anytime of the day! This does look tasty!! My older boy isn’t big on soups, it seems to be a texture thing with him sometimes. He will eat it occasionally, just not much of it. It would likely be a chicken and some kind of veggie soup here but I don’t see that being a big issue. This reminds me I need to boil down some chicken remains from the freezer for stock too!! Thanks Nicola!!!! Thanks Nicola! A nice quick and simple soup that doesn’t break the budget. Looks delicious! Yes it is nice to have a fast soup to make. We make something similar to this but without the corn. I’m going to buy a can next time it’s on offer and try this out.